..so they dance! 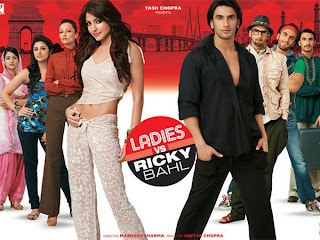 : Ladies vs Ricky Bahl - come for the get-ups, stay for the jilted women. Ladies vs Ricky Bahl - come for the get-ups, stay for the jilted women. Even though wiktionary defines the Finnish term "auervaara" as simply as a casanova, the term actually carries the idea of a man who scams women for their money. Ricky Bahl (Ranveer Singh) is a 21st century auervaara, that's for damned sure - instead of old, unmarried women, like his 20th century counterpart, he romances young, pretty daughters of well-to-do businessmen and the like. But his jig is up when three women he's conned - played by Parineeti Chopra (Dimple), Dipannita Sharma (Raina) and Aditi Sharma (Saira) - decide to team up to con him, with the help of formidable sales girl Ishika (Anushka Sharma). I went in expecting pretty much nothing at all. It was clear that The Dirty Picture (which I will see, soon I hope!) was the film to watch out for in December, and Ladies vs.. was a mere blip in the radar for both critics and audiences. I was therefore pleasantly surprised that what I got was a reasonably solid Yash Raj entertainer, with some caveats. Probably the biggest caveat is the film's main star himself. I'll give him some slack since it's only his second film, but the weight he has to carry here is just too much. Whereas other actors might have pulled off the cheesy costumes and fake facial hair he has to don for some of his cons with just the kind of cheesy panache required, Ranveer just looks a bit awkward, or trying too hard, or trying too hard to look cool despite cheesy get-ups. Then there are a couple of scenes, where even the conman ought to bring out some true, honest-to-god emotion. I looked, and looked, and looked, and couldn't find any. The movie asks - rightly - for its audience to root for the ladies, but the main star still ought to win me in some way, I feel, and Ranveer just didn't pull off that feat. But it's only his second film, and to his benefit or disadvantage, he started off big and is continuing big. With new stars we often speak of promise, and delivering on that promise. I'm not going to lie - what Ranveer lacks in acting he makes up in cuteness, gym-going, dancing and all this other shallow nonsense. So perhaps I am too harsh on the guy, but the ladies certainly were the reason I kept watching, not him. So the ladies won out for me - in more ways than one, and Anushka Sharma was also a joy to watch, though we didn't get a whole lot of her, and some that we got of her was pure beach-outfit-objectification type of material. However, when she gets to act, she shines, and I am warming up to her even more than previously. It's early days for her, just as it is for Ranveer, but I look forward to her developing more than him. But let's talk about the three women here some more. I found them probably the most real and interesting part of the film, and it's a shame the film takes at times a pretty cavalier attitude to the fact they've been conned. Of course, only Saira, whose family runs a little cloth boutique in Lucknow, really suffered financial setbacks from Ricky's con. Dimple is the daughter of a rich family, so only her heart gets broken, and her pride knocked about a bit. Raina's defeat is professional - she's the go-getter high-achieving businesswoman, unaffected by the con romantically, but nonetheless pissed off. The way they bond and find a common goal in defeating Ricky is quite charming, and generally they just fast became my favourite part of the movie. The songs are all quite fun, though fairly standard in terms of Salim-Sulaiman's style. But they do the job, and the leads are both good dancers, so they're fun to watch. If you'd asked me last night, I would have been far less hesitant to recommend Ladies Vs Ricky Bahl, but some sleep has made me think a bit more. There's a lot I would fix in this movie, and the love story - despite being developed quite well for the time that it has to develop - I couldn't care all that much about, so it's far from being the perfect movie. But it is fun entertainment throughout most of its run, and I think the three newbies in this should all be good to watch out for. Agree with every single word. Especially with Ranveer not living up to all the hype (yet). Thanks for commenting! Let's hope he does live up to the hype because the more younger heroes who are also good actors, the better, really.
" it's a shame the film takes at times a pretty cavalier attitude to the fact they've been conned." this was my major gripe with LVRB, and ESPECIALLY in regard to Saira. I was disappointed that the film had him find out about their plot and go along, rather than actually get seriously hurt before redemption. The innocent Saira especially, deserved that much, I thought. Not a bad film at all, but BBB2 it wasn't sadly. Yep, they obviously thought it was too much for the main "hero", even if he was an anti-hero of sorts, to lose his pride in the process. But it makes the redemption feel less like one, and so my sympathies never really go behind him. My friends love him. They think he acts so well and all I can say is "oh...I don't feel like that yet". I laughed at him showing his body again and again! He's like Ranbir to me: with time, he grew up and made me like him. He's even in a better position than Ranbir, since I hated him in Saawariya and at least liked Ranveer in BBB. It was Anushka's worst perfomance to me, but I think the script was the problem. I couldn't believe the lead pair's love and that was fundamental to like Ishika. That kiss in the end was painful to watch, it had no passion! I loved³ the girls, specially Aditi Sharma. She was great in Mausam, too. Someone to look at! I laughed at him showing his body again and again! It was fairly funny, true! I think there's definitely something about Ranveer and the combo with Anushka worked reasonably well in BBB, maybe not so much in here. I think they've got okay chemistry, just not the sort of incredible chemistry you get when two people can both really act. Hopefully the three girls will get themselves onto better films in the future!